Karur Vysya Bank Ltd (BSE: 590003, NSE: KARURVYSYA) on Tuesday saw a significant buy of 9,00,834 shares by the foreign institutional investor, Goldman Sachs Investments Mauritius I Ltd, which amounts to around 0.84% of the total shares of this private sector bank. The massive buy worth Rs. 33.78 crore was undertaken by Goldman Sachs in NSE, at a per share price of Rs. 375. Interestingly, there were no identifiable institutional investors or promoters as counterparties to the buy. The promoter stake in Karur Vysya Bank (KVB) is just 3.26%, mainly due to a regulatory requirement for private banks in the country. Goldman Sachs’ buy follows a massive buy of Karur Vysya stock by noted PE firm ChrysCapital on Friday. Warhol Ltd, a ChrysCapital arm, had acquired 42 lakh shares or 3.92% of KVB at Rs. 379.99 a share, making the deal worth Rs. 160 crore. ChrysCapital was co-founded by noted private equity player and its current Senior Managing Director, Ashish Dhawan, who was formerly with Goldman Sachs. Notably, there was a ready seller for a major part of that mega purchase, as India Max Investment Fund Ltd, sold over 26.99 lakh Karur Vysya shares at Rs. 380 a share, which covered over 64% of ChrysCapital’s buy. India Max Investment Fund is an FII sub-account registered under the FII, Rahn & Bodmer Co. which is a Swiss private bank. Oddly enough, despite the huge purchase by ChrysCapital on Friday, Karur Vysya Bank didn’t perform well on the bourses, either on Friday or the next trading day, Monday. On Friday, Karur Vysya was down by 2.18% and on Monday by another 0.65%. Though the Indian Budget that had no much sops for the banking industry was partly to blame, it is also evident that Karur Vysya Bank has enough selling pressure too at these levels. It will be interesting to watch the calls being made by other large investors in Karur Vysya after significant buys by ChrysCapital and Goldman Sachs, as well as the massive sell by India Max Investment Fund. Other large investors in Karur Vysya include GMR & HIS Group Companies, celebrity investor Rakesh Jhunjhunwala, Lotus Global Investments, HSBC, Ares Diversified, BlackRock, & Acacia Partners. Total institutional holding is high at 27.88%, dominated by FIIs. For many of its early investors, including Rakesh Jhunjhunwala, Karur Vysya Bank has been a high-performance stock. During the past few fiscals, Karur Vysya Bank has been an outperformer fundamentally, but in the current fiscal-year-to-date, bottomline growth has turned sluggish. Another concern is the direction banking stocks would take now as the probability for a fast interest rate cut has weakened. 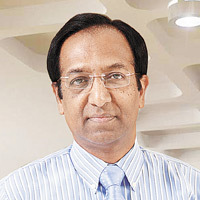 During mid February, Fitch Ratings had migrated Karur Vysya Bank's national long-term rating and the rating for KVB's Rs. 300 crore lower tier-2 subordinated debt program to non-monitored category due to lack of adequate information from the private sector bank. On Tuesday, buoyed by the Goldman Sachs buy and a rebound in Indian markets and especially in banking stocks, Karur Vysya Bank closed up by 0.75% in NSE, at Rs. 375.35.